Adding fresh herbs to a meal can turn it from drab to fab. A bit of dill with fish, some fresh torn basil in Bolognese or some rosemary over baby potatoes – the possibilities are endless. Growing small amounts of different types of herbs means you will have the freshest ingredients for your cooking with very little effort. And thanks to Dobbies, now there’s a way that you can have fresh herbs to hand without giving up a lot of space for a herb garden. The herb pyramid is a stylish and functional way to grow fresh herbs without taking up too much room. 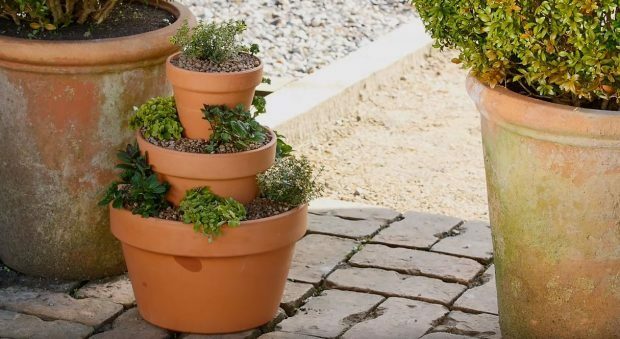 The pots stack neatly on top of one another and you can mix and match the herbs depending on the season or tastes. Just follow these easy steps and soon you will have aromatic and tasty herbs. Put some compost into the largest pot until it’s nearly full. Press it down with your hands so it is firm. 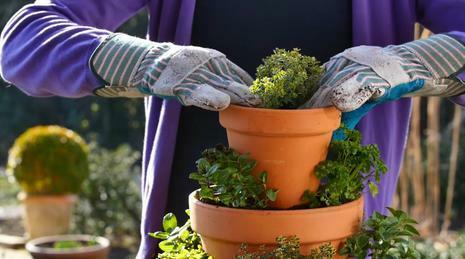 Place the next pot on top of the compost in the big pot and begin to plant herbs around the edge. You can use five herbs in the bottom layer. Repeat steps 1 and 2 with the second pot, followed by the smallest, which will sit on the top. Use three herbs in the middle layer and one in the top. Add a layer of horticultural grit to the surface of the compost in all three pots. The grit will provide a smart finish and deter slugs. Water the pyramid gently, taking care not to splash liquid down the sides of the pots. Make sure to put the pyramid in a sunny spot, because herbs like warm conditions. Once you have planted in the pyramid you will need to make sure to water it regularly (but not so much that the compost becomes saturated), weed it when needed and keep an eye on any mint you plant, because it can overrun the others. The key to using the herbs is to pick them little and often – don’t take too much from one plant or it will take a while to grow back. And once they are past their best, refresh them. Once you start using the herb pyramid, you will never need to buy herbs again!